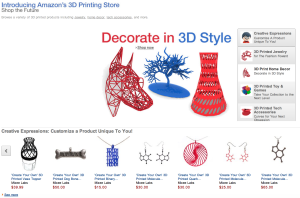 Have You Visited Amazon's 3D-Printed Store? Amazon now sells 3D printed goods, in an official section. You can customize things like wallets, bobbleheads, and jewelry, and Amazon will 3D print your item, and ship it to you for a pretty reasonable price. It’d definately novel. It’s important to Amazon’s future. Shipping simple products to warehouses around the world (Amazon’s current model), and buying inventory in advance is expensive. 3D printing prices are rapidly decreasing, and the technology is fast-evolving. Their entrance to 3D printing is small, but in the future, I think they will embrace 3D printing at a large scale, printing obscure items for customer to-order. They’re also the first large, mainstream company to embrace 3D-printed products (ok – maybe GE). It offers customers an introduction to 3D printing: When I talk to many people, they don’t really understand the technology, or what it’s capable of. Offering it on a site used by millions of people, means showcasing what the technology is capable of, and educating the public. The sooner that people are aware of 3D printers, the sooner a viable 3D printer will appear on your doorstep. It’s really affordable! Companies like Shapeways, who print custom 3D products to order, charge huge markups, given the material cost of what they are printing. Makerbot, producer of some of the finest 3D-printers available, does the same. Amazon is selling items starting at under $10. Help Bring 3D-printing into the mainstream! Back in the 1960s, micro-chips, invented by Fairchild Semi-conductor, were too expensive for the mainstream. They were revolutionary in nature, but everyday consumers couldn’t afford them, and it was holding the tech industry back. The CEO of Fairchild decided to cut the price of the micro-chip to one dollar, and instantly, demand skyrocketed, forever changing the tech world. We wouldn’t have the computers of today, if Fairchild hadn’t made that price cut. That’s why I urge 3D printing companies to cut their markup on items. It may hurt profits now, but it will help 3D printing into adoption, and benefit their company in the long-run. On that note, I’m creating a twitter-petition to urge 3D printing companies to cut their markup. You should sign it!